I love brunch. I think everyone who knows me knows I love brunch. 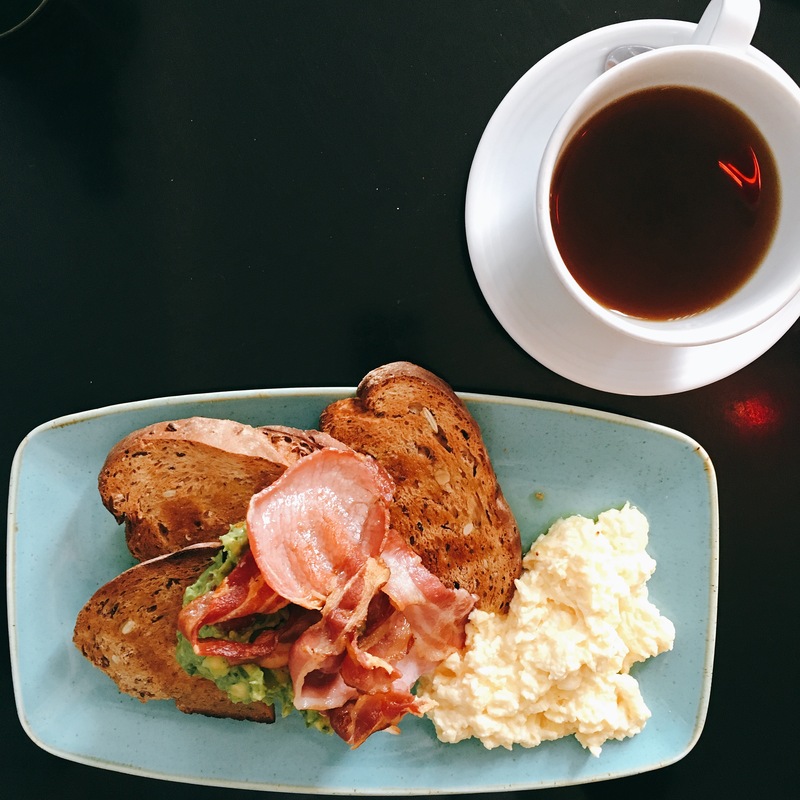 I’m on a mission to find the ultimate brunch spot in Edinburgh. I’ve already ticked off a fair few with Edinburgh Girl (they love brunch as much as I do). 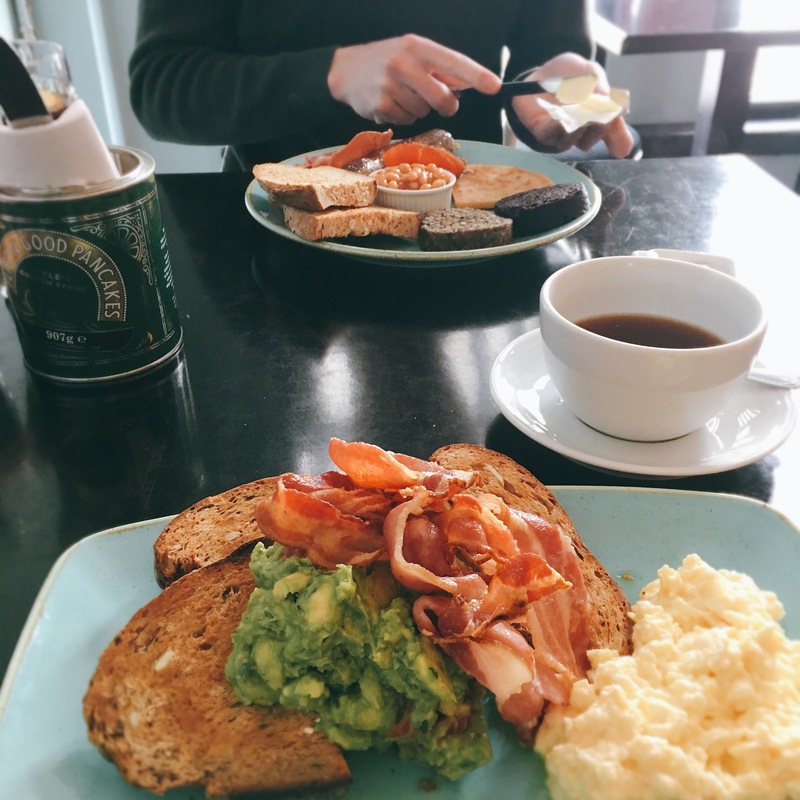 Mimi’s Bakehouse had popped up on my Instagram several times with people showing the beautiful cakes and coffees that are made on site (they’re seriously Instagrammable) but what of their breakfast and brunch offerings? They have two sites – one in Leith and the other in Corstorphine. We headed to the one on the shore on a sunny but cold day. Firstly, let me say their menu is one of the best I’ve come across. There were about twenty seven different things I could have happily ordered. I got serious heart eyes at their savoury french toast which is served with pork and caramelised onions, roasted cherry vine tomatoes. Alas, I’m supposed to be on a “diet” (and I use that in the loosest form of the word) so I went for avo on toast with crispy bacon. My boyfriend went for the full breakfast. Now, this is about one of the only negative things I am going to write: they only do scrambled eggs. No poached. No fried. No fun. My boyfriend doesn’t like scrambled eggs so I asked them to add them to my plate. Our meals came out in a reasonable amount of time and they looked delicious from the get-go. 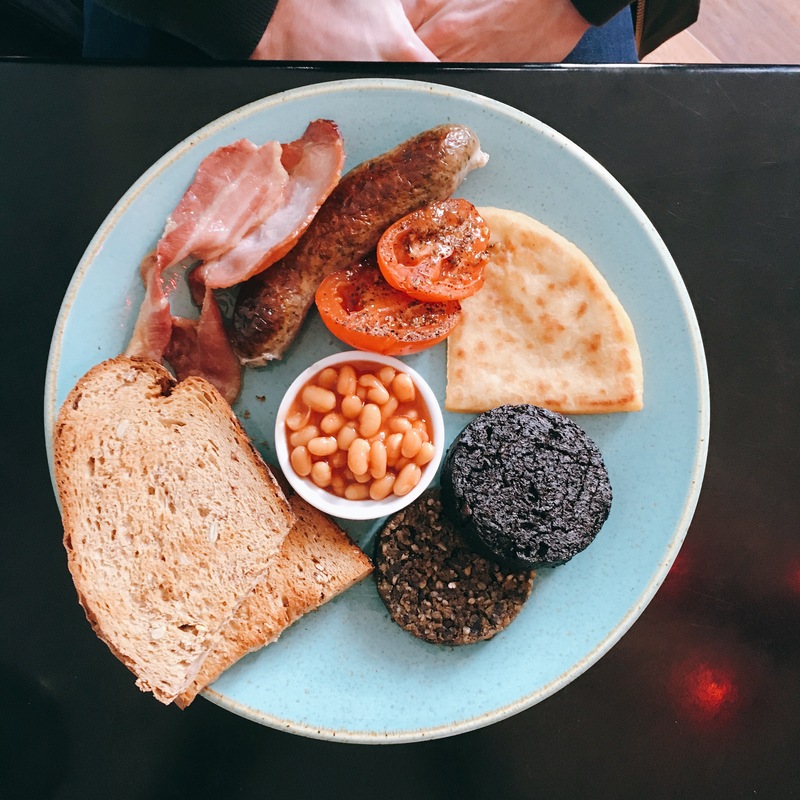 The full breakfast comes with sausage, bacon, black pudding, haggis, tattie scone, beans, tomatoes and toast (and scrambled eggs). The sausage was amazing (the pork and caramelised onion ones I spoke of earlier) and the boyfriend was pleased to report he enjoyed his whole breakfast. As an Englishman, he’s not quite ready to accept haggis for breakfast just yet, but we’re working on it! If he’d have had a fried egg he’d have loved it a whole lot more. To have that beautiful breakfast with no runny yolk all over it is sacrilege in our eyes. Mimi’s ‘award winning toasted bread’ topped with crushed avocado, cherry tomatoes, lime and coriander and drizzled in olive oil. As I mentioned I added bacon (additional £2.50) and had my boyfriend’s scrambled eggs so it was a generous plating I had in the end. The toast (3 slices) was nice and crispy, the eggs creamy, the avocado ripe and the tomatoes fresh. The lime and coriander is something I love with avocado as it just feels super fresh and rejuvenating to me. I wished the tomatoes had been grilled personally. If they’d also offered a poached egg on top I would have jumped at it. That being said, their scrambled eggs were evidently made with cream and were really decadent (see what I mean about my loose diet). The service was perfect, the girls who work there are all attentive, friendly and polite. After having had that bad experience on service, it was refreshing to get some good service again. All in all, we had a great experience and we didn’t even touch the cakes which you can see being made through a little glass partition. 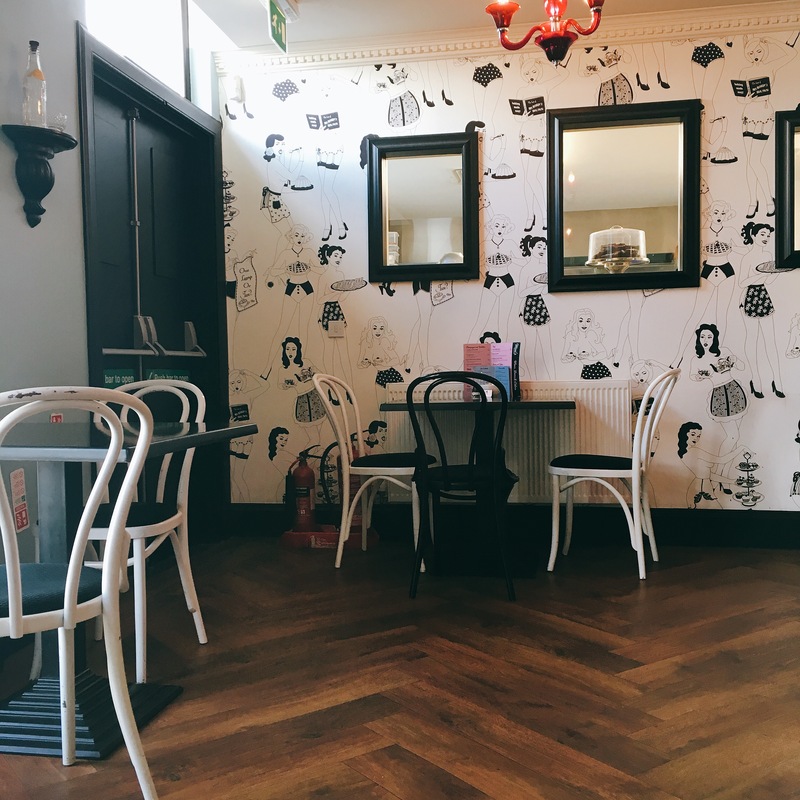 It was so good that I’m trying to organise an Edinburgh Girl Afternoon Tea there which came out to another table while we were there and I got serious food envy. If you’d be up for an afternoon tea, holler at me!